This week Farfetch, the luxury platform that connects customers, brands and retailers around the world, filed its initial form to go public. The company is one of the few fashion/luxury technology companies to reach a large scale—second only to Stitch Fix, which has more than three times Farfetch’s revenue. Farfetch makes money in a few different ways. 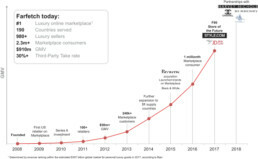 Its marketplace and associated services—photography, fulfillment, customer service and more—allow brands to sell directly to customers, which affords the brand a healthier margin than selling the products wholesale, or by allowing third-party retailers to sell their inventory to customers on the platform. This cuts the retailer’s margin in half but gives them access to a global customer base that is much bigger than what they would be able to access as a local store. 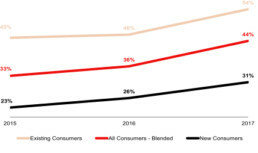 Farfetch collects the same amount of money in both scenarios, which is around 30% of the transaction, but the economics are much better for brands than they are for retailers. What follows is analysis of the Farfetch’s business. All of the data comes from the company’s F1 filing. Farfetch’s model, like that of many marketplaces, allows the company to make lots of inventory available, without needing to hold it. For the first half of 2018, Farfetch had 5.7 million stock units available on its marketplace, with a stock value (also called GMV) of $2.4 billion—growth of 46% and 33% respectively from second half of 2017. This inventory comes from over 3,200 different brands, which make 335,000 SKUs that are listed on the platform. This means the platform carries on average 105 SKUs for each brand, stocks about 1,781 units of inventory (or 17 units per SKU), all for a stock value of $750,000 per brand. Traditionally, little of this inventory sits in Farfetch’s warehouses for extended periods of time, and it likely only moves through it once an order has been captured—an important de-risking of inventory since Farfetch often has the money in hand within a few days of receiving the order. Even better for the company, after processing the order from a customer, it holds the cash for 45 days before paying it out to the seller, which gives it a huge float that a bank would normally need to fill. As a result, the company has zero debt, which is very rare for physical goods businesses, 99% of which are capital intensive. But the company is investing further into first-party sales, which is when it buys inventory from brands directly, like a traditional retailer would. In 2017, 13% of the company’s revenue (over $39 million) came from first-party sales, while 87% came from the commissions Farfetch charges brands and retailers. As a result, net cash outflow increases almost four times between the first half of 2017 and the first half of 2018, as the company requires more working capital to fund its own inventory. This is an interesting development, since taking on inventory somewhat rescinds the entire point of the marketplace model, although it would allow the company to deliver products faster while possibly lowering its shipping costs. While the company is able to float itself given its payment terms, it will be interesting to see if it needs to raise debt in the future if it plans to further shift its business toward first-party sales. As of June 30, 2018, Farfetch has 989 sellers on its marketplace: 614 were retailers and 375 were brands. 98% of the retailers have entered into an “exclusive relationship” with the company, which seemingly means they don’t sell anywhere else online, though the term is never defined. Farfetch boasts that it has retained all of its top 100 retailers and 99 of its top 100 brands in the last three years. But 22% of the company’s GMV is from its top ten retailers, even though it had over 614 on the platform, showing some centralization and power law-like dynamics. Farfetch had $909.8 million of gross merchandise value (GMV) in 2017, up 55.3% from 2016, which was up 53.4% from 2015. Given that the company had $1.8 billion of stock value at the end of 2017, it had a sell through rate of 57%, which is quite good, especially if a company doesn’t hold any inventory. For the entire business, 2017 revenue was $386 million, up 59.4% from 2016, which was up 70.1% from 2015. This number includes revenue from Farfetch fulfillment services—basically arbitraging FedEx and UPS-like carriers, as 91% of orders were cross-border in 2017—as well as its warehouse operation and revenue from Browns. For the core marketplace business, which accounts for over 90% of Farfetch’s revenue and is a good gauge of product sales, revenue was $296.4 million in 2017, up 63.8% over 2016, which was up 69.4% from 2015. The company primarily attributes this growth to a 53% increase in the number of orders on the platform to 1.3 million for the first half of 2018, as well as a 40% growth in active customers to over 1.1 million. The company defines an “active customer” as someone who bought something from the platform in the last 12 months. However, the company’s operating loss widened from $31.4 million in the first half of 2017 to $72 million in the first half of 2018. One of the big reasonings behind this growing operating loss is Farfetch’s rising customer acquisition costs. While the company grew overall revenue 55% in the first half of 2017, Farfetch’s cost of revenue grew 67%, which it attributed to rising customer acquisition costs and additional costs around fulfillment and processing fees. This is a very important number to watch, since it shows declining efficiencies from a growth perspective, even through the company argues that it has network effects (but this should lead to the opposite result). 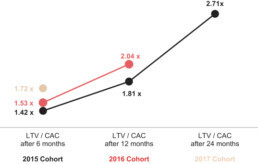 Additionally, Farfetch’s LTV/CAC ratio, which measures the ROI on the cost to acquire a customer, has been growing—from 1.42 in 2015 to 1.72 in 2017, which means that in 2017, for example, each customer was worth 1.72 times what it cost to buy them. While the numbers are trending upward, they are still low, as it should be closer to two to three-times, which is often found in healthier businesses. However, the company’s contribution margin from each order, which is the gross profit from each order minus the cost of acquiring the order, increased from 33.0% in 2015 to 35.0% in 2016 and 43.0% in 2017. Since the company has been increasing its customer acquisition costs, one possible explanation for these positive trends is the rising average order value (AOV), which grew 6.2% in 2017 to $620, and has grown another 5.1% to $622 at the end of June 2018. If the company can keep growing AOV and orders per customer, it has a chance to mitigate its rising acquisition costs. As Farfetch sees rising consumer interest from various international markets, it is specifically taking advantage of China’s growing luxury industry, which is expected to account for 35% of personal luxury goods sales in 2025. The company continues to invest locally to secure this opportunity in the country, including its current talks to acquire the domestic technology company CuriosityChina, which can expand Farfetch’s domestic presence in terms of digital marketing. In June 2017, Farfetch also partnered with JD.com, the second-largest ecommerce retailer in China, which provides Farfetch access to its logistics network and consumer payment solutions, as well as technology and marketing resources such as WeChat. JD.com also made a strategic investment in the company and its founder joined Farfetch’s board. The company believes that it can continue growing in other emerging economies, including Latin America and the Middle East, and it is increasing its inventory to serve these markets. In 2015, Farfetch bought Browns, the London-based luxury department store, for just over $10 million in Farfetch stock, which it valued at just under $32 million. The department store booked $15.4 million in 2017 revenue, which shows nice growth after the acquisition. Browns has become the testing ground for Farfetch’s store of the future plans, although this initiative is still very early in its evolution. The other interesting disclosure in the filing is the further detail about Farfetch’s acquisition of Style.com, which was the failed ecommerce venture from Conde Nast. The media company apparently invested over $100 million into it, but sold its assets for Farfetch for only $12 million, which was converted into stock. The two companies now have an affiliate partnership, and Style.com now redirects to Farfetch’s homepage. Altogether, these two acquisitions seem like good deals. While the numbers look rather good for Farfetch, it will be important to watch how critical indicators like the company’s acquisition costs and percentage of first-party sales change over the coming months, especially once it’s listed in the public markets. Farfetch is a maturing business—it turned ten this year—but there is plenty of marketshare left to capture as luxury sales continue shifting online. At the same time, the company has raised over $700 million in venture funding and only has revenue of under $400 million, while Stitch Fix raised raised only $42 million but had revenue of over $1 billion when it went public. While there are many more competitors out there, Farfetch’s physical logistics infrastructure gives it an advantage, much like Amazon’s fulfillment infrastructure does in the realm of mass ecommerce retailers. But Farfetch has done something Amazon has not: get fashion and luxury brands to love them. That’s definitely worth something.